Knowledge : Tomesode - KIDORAKU Japan - What a Kimonoful World! 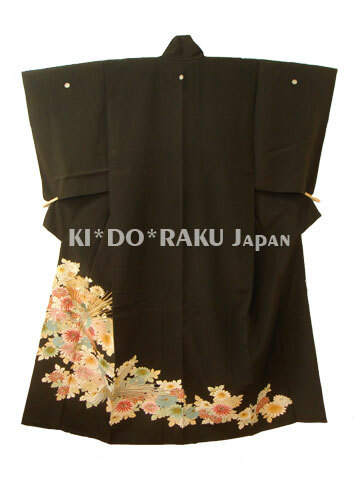 Tomesode is a formal kimono with designs along the bottom. like marriage ceremonies of family or relative. It's equivalent to evening dress of Western clothes. There are "Kuro-Tomesode (Black-Tomesode)", and "Iro-Tomesode (Color-Tomesode)". "Kuro" means "Black", and "Iro" means "color". It's depend on base color. "Kuro-Tomesode" is worn by only married women. It is the most formal kimono of married women. It has 5 family crest. "Iro-Tomesode" is worn by unmarried and married women. Having 5 family crest is formal, but 3 or 1 crest are allowed.